The AmD with AutoAid/RCIB Insurance Racing team will hope to break back into the top ten this weekend when the Dunlop MSA British Touring Car Championship heads for Oulton Park for round four. The West Thurrock-based team has picked up four top ten finishes so far in 2018, which is the first season that it has run the race-winning MG6 GTs in the series. For Forton-based Tom Boardman, the Oulton Park weekend will be one of the biggest of the season as the former race winner prepares to compete at his home circuit for the first time 2011. Tom started his season with a fine fourth place finish in challenging conditions at Brands Hatch but was out of luck at both Donington Park and Thruxton, where incidents not of his own making robbed him of the chance to score more points. 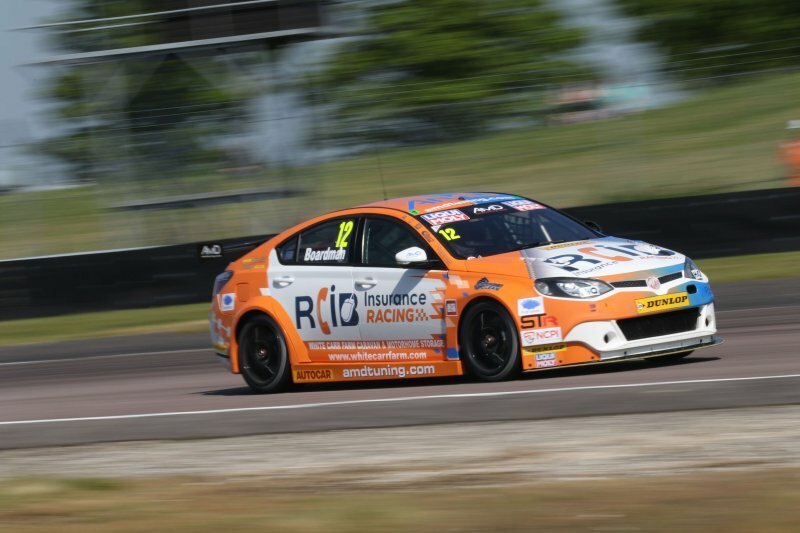 The 34-year-old heads for Cheshire buoyed by a strong end to the weekend at Thruxton last time out where he admitted to feeling like he had turned a corner with the MG, and his focus is firmly on trying to fight towards the top 15 places. Team-mate Rory Butcher was also in the wars in Hampshire last time out after an accident in practice hampered his on-track efforts, but he fought back well to pick up his sixth points finish of the season on race day. Those results mean the Fife racer is well placed in both the Independents and Jack Sears Trophy standings and he goes into the weekend keen to challenge towards the top ten to maintain his championship positions. “I’m really looking forward to Oulton Park this weekend as it’s my home circuit and a circuit that I really enjoy driving. Things didn’t quite go to plan for me last time out at Thruxton but we made huge progress in the final race there, and I want to try and build on when we hit the track this time around. “I’m feeling very positive about the weekend. Thruxton was a tough one for us but we showed good pace again in the races and rescued some points which is encouraging going to a circuit in Oulton Park that should be better suited to us. “Whilst we have raced well this season, we have room to improve in qualifying and that is something we have to focus on a bit this weekend so we can give ourselves the best chance on pushing towards the top ten on race day. “It’s a big weekend for Tom this weekend as he prepares for his home meeting and we feel confident that he can have a strong one given his performance in the final race at Thruxton. The pace he showed there was really good and his points tally so far this year doesn’t reflect how well he has driven when you consider how long he had been out of a race car before the season started. Photo again courtesy of Marc Waller.